"Alias's" Jennifer Garner returns as ELEKTRA who having survived the seemingly mortal wounds she suffered in "Daredevil" becomes the world's most dangerous assassin. When she gets her latest assignment, Elektra makes a decision that can take her life in a new direction- or destroy her. A spin-off from the “Daredevil” comics, “Elektra” is the world’s most dangerous assassin. Played by the gorgeous Jennifer Garner (“Alias”, “13 Going On 30”), Elektra possess agility, skilled in the weaponry, Sais and the ability to foreseen future events. Despite the paper-thin plot, Garner who trained immensely for her role has proven that there’s no actress out there who is a better substitute. She is a one-man fighting machine equipped with long flowing tresses, capable of winning over any potential enemies and male species in the audience. The movie opens with Elektra hunting down her target (Jason Issacs in a cameo) and later on we learnt that she was once brought back from the dead by Stick (Terence Stamp), a wise blind man who has a zen-like serenity and master of “The Chaste” and long-time enemy of the wealthy, evil “The Hand” clan. Director Rob Bowman (“Reign of Fire”, “The X-Files”) and the screenwriters have created Elektra to be a woman searching desperately for her identity, she sees herself as a killer machine, lost and isolated from the world. When she comes upon a father and daughter who are pursued by “The Hand”, her purity in her heart springs to uncover the natural heroine instincts and regaining her past emotions and happiness. Unfortunately, the pacing of the movie is seriously uneven. This glitch might caused a few action-starved fans to crack up though there are a few combat sequences which sees Elektra executing her sais with excellent fluency. Most noteworthy are the posse of colourful villains who appeared in the movie. Kirigi, a master swordsman, Tattoo with magical power from his array of animal tattoos which can come easily to life and Typhoid Mary who possess deadly breathe and feel. But with each from the group encountering an easily defeated death, it’s hard to leave any deep impression or feel much of the characters. 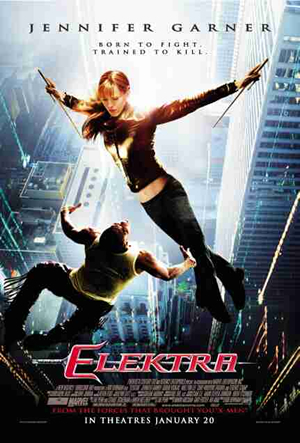 At the end of the day, “Elektra” is again not one of Marvel’s best movie adaptations. Bordering between character development and cheesy effects, the original energetic feel of the comics is lost in translation to the big screen. It’s electrifying to see Jennifer Garner in “Elektra” but it’s not electrifying enough to jolt us to see more of the movie.